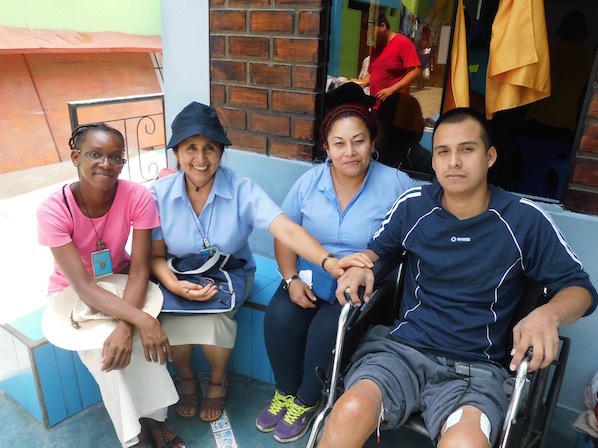 Marist Missionary Sisters have ministered to prisoners in Lima, Peru for more than 40 years. Within the prison itself, they helped to establish a drug rehabilitation program that has changed the lives of many. Presently there are 9 small communities within the prison for faith sharing and mutual support. The Sisters also meet regularly with former prisoners to help them on their ongoing journey. The photos above were taken at Easter when Bishop Norberto Strotmann, bishop of the Diocese of Chisca-Lima presided at the Mass in the prison. There is also a photo of a novice from the Congregation of the Holy Cross, from Burkina Faso, presently working with Sr. Carlota. They are visiting a young man who suffered a spinal injury from a gunshot wound. He is making a good recovery.